Villa Rita for 8 guests, just 1km to the playa! 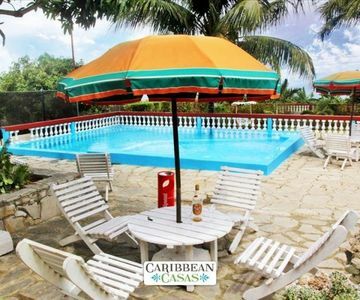 Walk to the beach from this charming 4-bedroom villa for 8 guests, just 29km from Havana! This cozy Caribbean getaway lies on 1500 square meters of land with a private pool (5m x 8m), an exterior dining area, and a barbecue zone. All on one story, the villa features a fully equipped kitchen (gas stove, over, refrigerator, freezer, coffeemaker, washing machine, and clothes dryer). The 4-bedroom villa welcomes 8 guests, but additional beds can be added for an extra cost. Each bedroom has one double bed and an ensuite bathroom. There is also a bathroom outside by the pool. Challenge your friends and family to a game of pool on your own billiards table! The beach is approximately 10 blocks from the villa.